Build something for the special guy in your life with Tools of the Trade, a set of five tools, perfect for masculine cards, gifts and scrapbook pages. The set includes a hammer, saw, screwdriver, pliers and wrench. 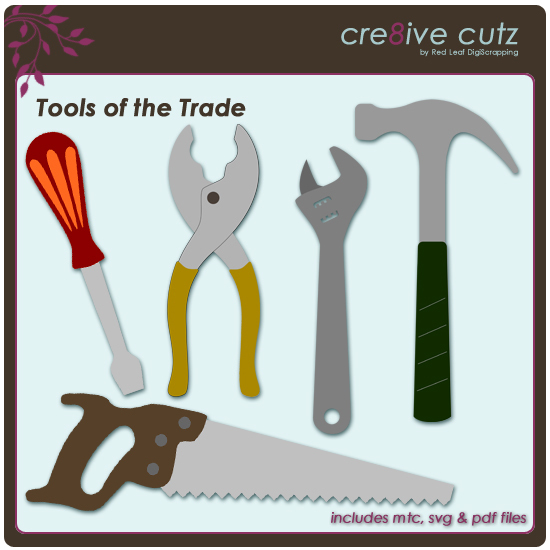 With Father's Day coming up, this is the perfect file to create a unique card for him, or pair the tools with our Toolbox for a gift he'll remember! The download includes SVG, MTC (for Make the Cut! software) and PDF files. This file cuts well on any size mat. Just click here or on the image below to purchase Tools of the Trade in the 99 Cent Store. I will be launching a Cre8ive Cutz newsletter in the very near future, so you can have all the news about freebies, new 99 Cent files, tutorials and inspiration delivered right to your inbox. There will very likely be the occasional freebie or special deal for subscribers as well (hint, hint!). I haven't nailed down the exact publishing schedule yet, but it will be no more than once a week. You can subscribe to the Cre8ive Cutz Newsletter by clicking here or on the Cre8ive Cutz Newsletter ad in the right hand column. That will take you to another page where you fill in your info (name and email is all you will be asked for) and then there is a quick email confirmation and you're all signed up. Thanks and look for the first newsletter soon in your inbox! Does anyone feel like going to the beach? 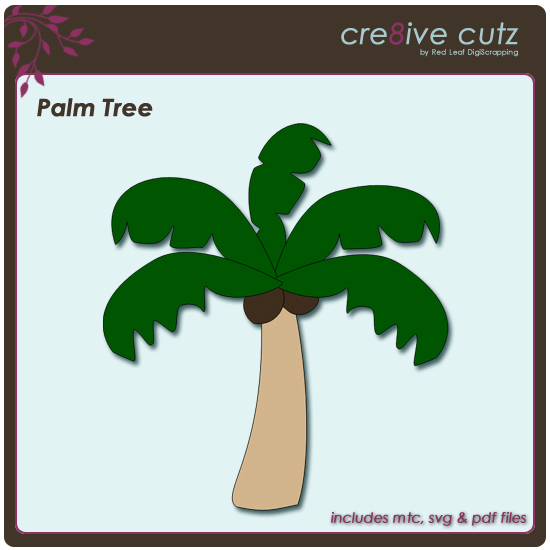 I have an new freebie for you, a layered palm tree that you can use to dress up your beachy scrapbooking pages or make a special card for a beach loving friend. The file includes a full base layer and a single layer for all the leaves, as well as the trunk and leaves as individual pieces, so you can add lots of layering, texturing and dimension to create a really realistic looking palm tree. As always, SVG, MTC and PDF files are included in the download. Just click on the preview below to grab this freebie and enjoy! 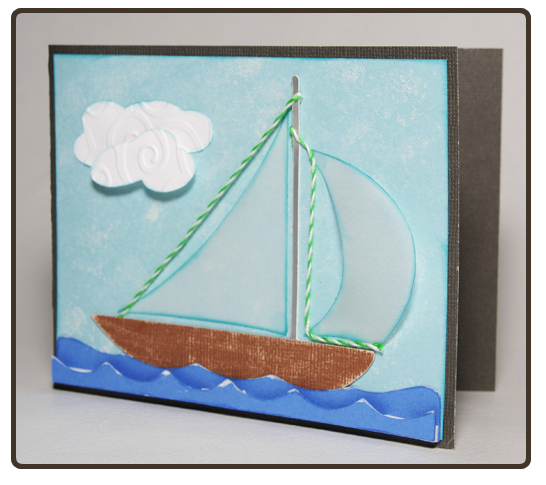 Happy National Scrapbooking Day everyone! In honor of NSD as well as Mother's Day which is fast approaching, I'm giving a way a special freebie to all my Facebook fans. 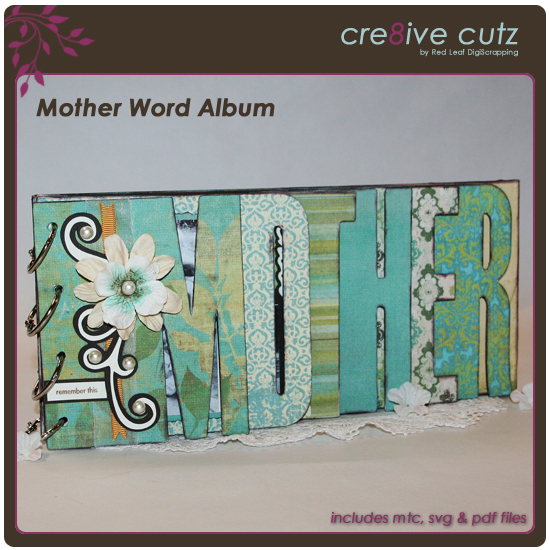 This pretty Mother word album can be used to create a special photo album for the special mom in your life, or cut it a little smaller and make a unique Mother's Day card. To grab the freebie, just click on the image below which will take you to my Facebook page. From there, if you are already a fan, click the Fan Freebie icon at the top of the page to get the download link. If you aren't already a fan, simply like the page and then grab your freebie download. <<This item has been moved to the 99 Cent Store. Click here or on the preview photo below to purchase it.>> Thanks everyone and have a great weekend! Do you remember the Sailboat SVG freebie cutting file I posted a couple weeks ago? I thought I'd show you what I made with it. First I brought the file into Make the Cut and created a full card layout with it. I made the clouds by merging some ovals and circles together, then I duplicated the waves and did a little node editing to add the second layer of waves. Next I cut out all the pieces. Here they are before assembly, the clouds have been embossed but nothing else has been done yet. And finally, here is the finished card. I used a piece of crumpled paper towel and dabbed white ink onto the background to create some subtle clouds. 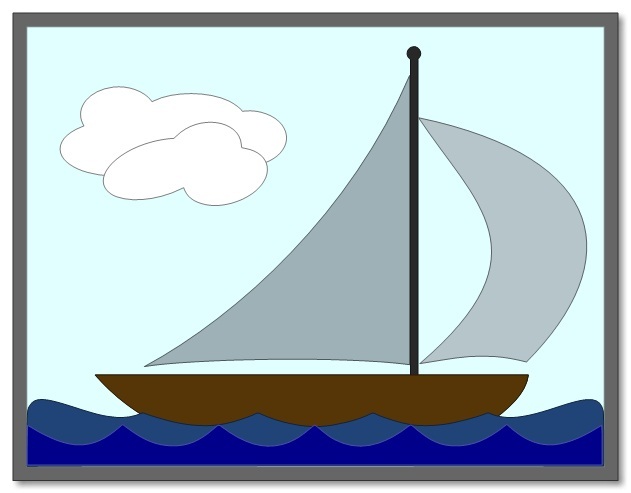 Then I inked the edges of the clouds and sails with Tim Holtz Broken China ink and sanded the boat to scuff it up a bit. I added some bakers twine for the ropes, and used dimensional adhesive to pop up the small cloud and the top layer of waves. 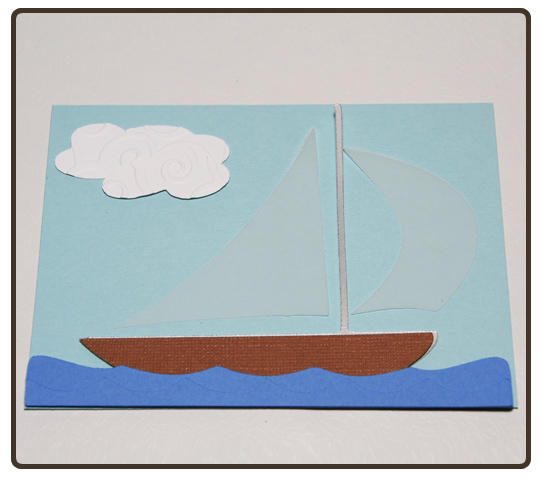 I also puffed out the small sail before gluing it down, to give the illusion of wind. What a difference a little ink and dimension can make to the finished card!